A new website, with print collateral and promotional support, helped Cartwright’s new division make a name for itself. 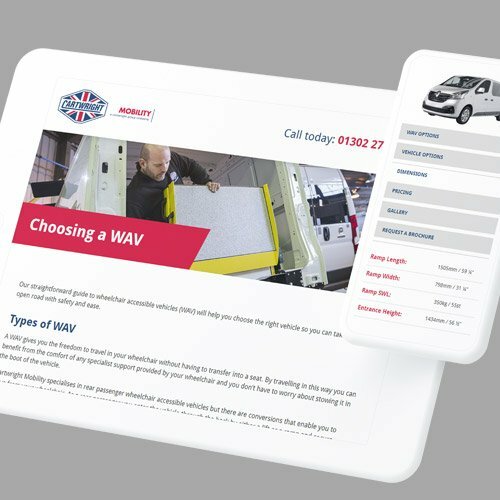 Cartwright Mobility is part of the Cartwright Group, one of the UK’s leading commercial vehicle body, trailer and conversion manufacturers. The Mobility division of the business, which specialises in providing wheelchair-accessible vehicles, has grown out of Cartwright Conversions, eventually becoming its own standalone brand. 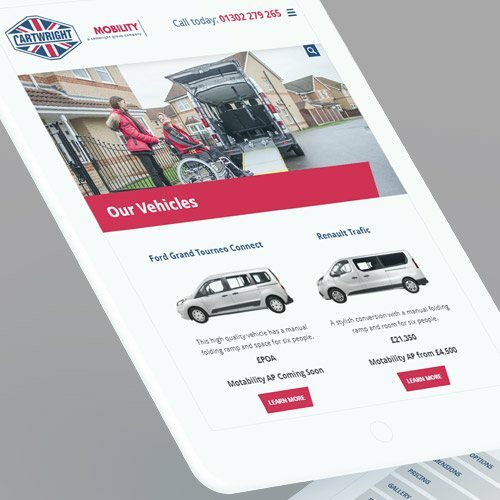 In order to launch Cartwright Mobility as its own entity, rather than as a service provided by Cartwright Conversions, they needed a new website, an adapted brand that showed they were separate from other Cartwright Group companies, sales collateral, and an initial marketing push to get things going. Cartwright Group, as a whole, has a long-established and highly recognisable brand identity – once you know it, you might be surprised how often you see their logo pop up! This meant that we didn’t necessarily have a clean slate for a new brand – rather, we would need to expand upon and adapt existing elements of the Cartwright Mobility brand to create something new. We developed a new colour palette that made use of the existing Cartwright Red brand colour, but scaled down the corresponding Cartwright Blue in favour of green and gold highlights that call safety and quality to mind – important factors for the target audience. The new brand also introduces a new font – Fs Me – which was developed in partnership with Mencap to improve legibility for people with learning difficulties. Many elements of the new site use a block of colour with an angled finish. That angle is set specifically at 75º, something not used elsewhere in the Cartwright portfolio, to create a consistent identifier for the mobility brand. To help the Cartwright team manage the brand going forwards, we put together a comprehensive style guide, complete with recommendations on copywriting style and tone of voice, with certain written styles chosen to accompany the overall look and feel of the branding. The site needed to meet AAA accessibility standards, which meant it would have to accommodate multiple colour schemes and text sizes, so a number of visual elements were designed to be very minimal, in order to aid legibility. 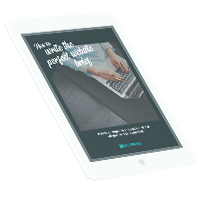 Product specifications in particular are very simple to digest, with clear images, tabbed sectional views to avoid information overload, and bold checklists to explain features. We designed a number of different illustrations, assets and elements that can be combined in a wide range of ways, which makes the modular site very versatile – and means the team can re-purpose them as they need in order to add new pages to the design. Built in WordPress, the site can easily be updated using the content management system (CMS) in the back-end. The vehicle pages themselves use a custom post type, so they can be kept separate from the rest of the site in the admin panel, for ease of use for the Cartwright team. The accessibility features are accessed from a menu at the top of the page, and all of our usual improvements to speed, SEO and contact forms are included. To assist with the initial sales and marketing push around the new brand, we designed and laid out a number of product brochures for the Cartwright sales team, provided print ads for newspapers and magazines, and produced a number of banner ads for PPC advertising through the Google Display Network. We’ll be continuing to support the Cartwright team with ongoing site maintenance. We’ll also be providing monthly reports on performance, with SEO and marketing recommendations for the team to implement. Fantastic design that is well thought through from a fab team who are really approachable and always happy to help.